Ballpark Basics: From (near) worst to (almost) first. 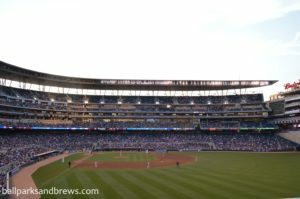 Ballpark Breakdown: When the Twins announced that the ballpark that would replace the aging Metrodome would be outside without a retractable roof many people complained. 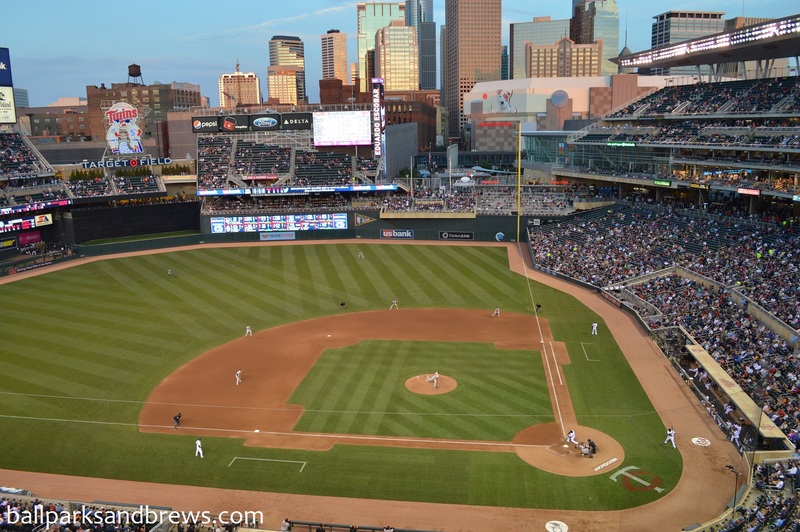 The thought of a night game outside in Minneapolis in the early spring or late fall is not an enticing idea. Luckily they did not listen to the detractors. Located in downtown with close proximity to mass transit and a number of local eateries and breweries it makes it easy to make a whole day out of a game. 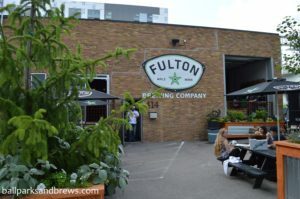 On our trip, we were able to walk from our hotel and pick up some dinner before the game and then stop off at Fulton Beer (see below) afterwards. 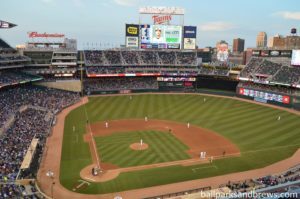 When the Twins moved from the Metrodome to Target Field in 2010 they upgraded from one of the worst ballparks in baseball to one of the best. Instead of a wall that resembled a large trash bag in right field they now have the city skyline as their backdrop. While the games early and late in the season require some extra layers taking in a game in the middle of the summer is just pure heaven. The ballpark also does a great job of incorporating local aspects throughout the park, from the large Minnie and Paul logo atop center field, to the limestone wrapping the entire ballpark, to the Target Plaza with history and memorabilia from the Twins history. Best Spot for Beer: While there are local options sprinkled throughout the park at beer stands the Twins Pub located in the right field corner will give you your best options (and the only place you will find Surly on tap). 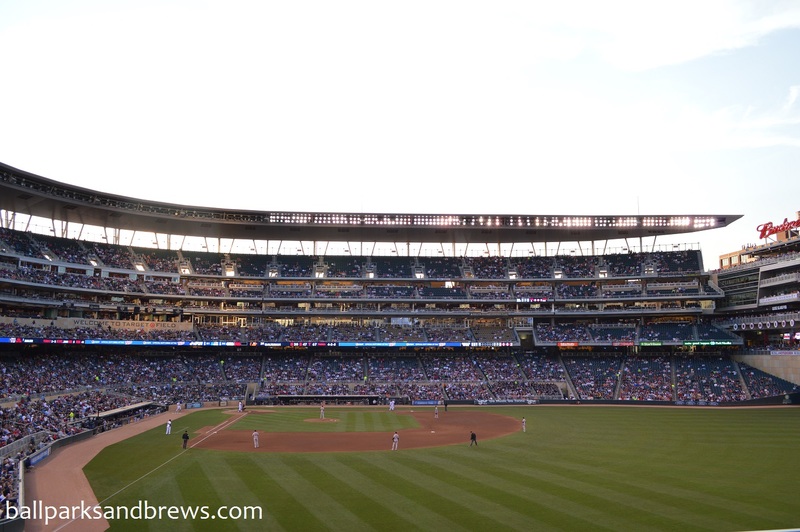 The beer stand in the left field corner, called “Twins Brews: Beers of Twins Territory” also has a number of local brews including Summit and Indeed. Minnesotans had the comfort of watching baseball inside a climate-controlled dome for almost thirty years. 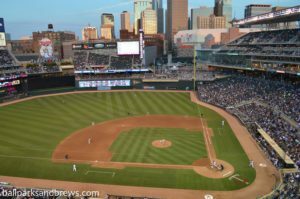 While the temperature may hinder the enjoyment during the beginning and end of each season Twins fans now get to enjoy baseball in one of the nicest parks in all of baseball. 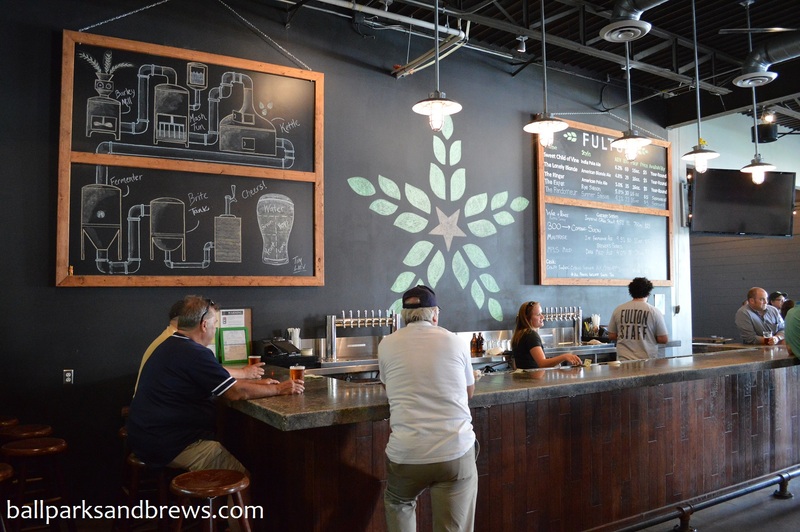 Brew Basics: Food trucks, farm co-ops, and friendly folks. 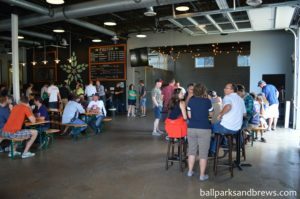 Being a good sized city, Minneapolis had plenty of breweries to choose from, and we tried as many as we could in the time our visit allowed. Many of them have good things going on, including Surly, which is getting quite a following well outside the Minnesota borders. We recommend both Surly and Indeed, but are choosing to write up Fulton for this pairing being both a local favorite with a ton of potential, and in the shadow of Target Field. The place itself was large, open, square and centrally located in close proximity to the Twins. Approaching from the front you come across a large open space with tables and picnic benches, and lots of people despite the rain. Going up concrete ramps will take you inside, which is divided into three main areas, a bar corner, a large communal space and a smaller square in back. Food trucks were parked outside, attentive employees were constantly on patrol, the swag area was large and made even more popular by the fact that a farm co-op was in house for order pick up. A problem throughout our Minnesota stops was an absence of flight options. Fulton was no different and actually didn’t have any pours smaller than 16oz, save one high gravity 12oz option. 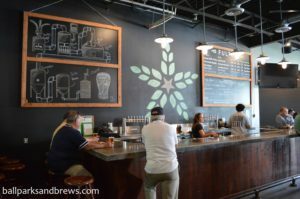 This made it hard to try too many and still continue on with our day, but seeing as this was common to all of the breweries in Minneapolis and the surrounding areas, we didn’t take points away from Fulton, but it did make it hard to try all of the available styles. Lonely Blonde – (4.8 ABV/29 IBU) Light pale yellow Very wheaty in smell and taste. Moderately carbonated that was much better when it was first served very cold, and took on a more stale and plain taste as it warmed up a bit. MLPS Mild – (4 ABV/17 IBU) An English ale that was dark but mild. Only served in 20 oz., which was a lot of beer, but they were charging the same price as the other 16 ouncers, so that was cool. The Mild had a malted nutty smell, and caramel toffee malts in taste with just a little sweetness. It finished dry and malted with a tiny bite. The Randonneur – (4.1 ABV/22 IBU) Summer Saison in style and very yellow in color, with high filtering and visible carbonation. For being a saison, it was absent of earthy or grassy notes but smelled of banana and cloves. The taste was also mostly the banana and clove notes, which reminded us more of a filtered hefeweizen as opposed to your more traditional saison.